The Cleveland Museum of Art will be handing over 14 antiquities to Italian authorities later today, Wednesday ("Cleveland museum set to return Italian ancient art", The Associated Press State & Local Wire April 22, 2009). Timothy Rub says the transfer of the art, which includes ancient pieces looted or smuggled out of Italy, will take place Wednesday. As part of the agreement, Italy has promised to lend 13 objects comparable in quality to the returned antiquities and to cooperate on future exhibitions. There is nothing about the resolution of the discussions relating to two other pieces, the "Cleveland Apollo" and a bronze Nike (see earlier comments). The museum also needs to disclose the full collecting histories of the returning pieces (see earlier comments). 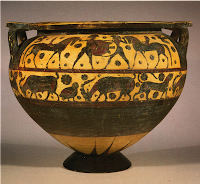 Corinthian krater (formerly Cleveland Museum of Art 1990.81). Source: MiBAC.